Hillard Miller drove his late model back to victory lane for the first time this year Saturday night at Oakshade Raceway. Rick Delong grabbed the lead at the start of the late model feature and Hllard Miller, who started alongside Delong on the front row, tucked in behind the 3 car of Delong. The top two broke away from the pack, but Rusty Schlenk and last week’s feature winner, Kris Patterson, tried to close the gap. The first caution came out for Greg Martin who spun out. On the restart, Miller made a challenge for the lead, but Delong held on and actually pulled away from the second place car. Things changed once Delong caught the tail end of the field and began dealing with lapped traffic. Miller closed back in on the back bumper of Delong and on lap 17, took the lead away. While the two leaders were battling with each other and lapped traffic, Kris Patterson had also closed in on the lead duo. Once Miller had opened up a little distance over Delong, Delong found he had his hands full with trying to hold off Patterson for second. Hillard Miller took the checkered flag for the first time this year, even after a close call with Ron Miller who was trying to keep from going a lap down on the final lap. The battle for second continued right up to the finish line with Rick Delong holding off Kris Patterson for second by the nose of his car. Rusty Schlenk finished fourth with Mike Marteney finishing fifth. The sportsman feature also produced another first time winner for 2003 with Devin Shiels driving to an impressive win. Tim Shelley and Rusty Smith battled early with Smith leading much of the first half of the race until Bill Eversole spun on lap 6 bringing out the yellow flag. Devin Shiels powered to the outside of Joe Derbeck and Rusty Smith to go from third to the lead on the first lap after the restart. Shiels then drove away from the rest of the field for the easy win. Joe Derbeck finished second with Ray Klawitter third. George Laney led from flag to flag in the bomber A Main. Gary Cole had a good run going until he drove the wheel off his machine after working his way up to fourth. Randy Miller became the first driver to take the Tail Start Challenge this year, giving up his starting spot to start at the tail and a chance at an extra $400 from Racer’s Connection if he won, but mechanical problems on lap 6 took him out of contention. Finishing second behind George Laney was Bill Toedter. Kevin Cole came across the line third with Josh Steinacker finishing fourth. Tom Ordway was the winner of the bomber C Main, also leading from start to finish. David Goben and Jim Chapman had a good battle for second with Chapman beating Goben for the runner up position. Brent Myers led the first few laps of the bomber C Main, but shooting toward the front in a hurry after starting mid-pack was the 44 of Gordon Digby. Digby took the lead on lap four and didn’t look back. A couple laps later, Myers night ended in a plume of smoke as he retired to the pits. Digby won uncontested followed by a distant Patrick Bell who finished second. 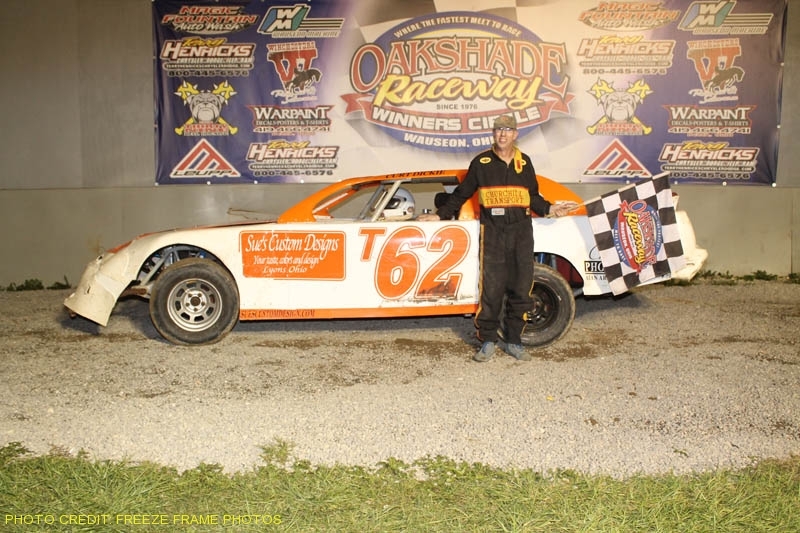 This coming Saturday night will feature more great stock car racing at Oakshade Raceway featuring late models, sportsman/trucks and bombers.